Can I drink coffee when I'm pregnant? In Kuwait, there is a Starbucks Coffee on practically every corner, and at least half a dozen in every mall—and the first thing you are offered as a guest is coffee or tea. 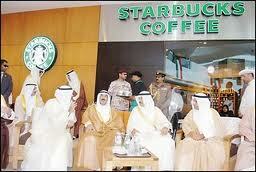 I think it's fair to ask, do we spend more on coffee or petrol in Kuwait? As you know, coffee and tea both contain large quantities of caffeine. What effects does all this caffeine have on the mother trying to get pregnant, and the mother and her baby once she is pregnant or breastfeeding? The short answer is: studies have shown that caffeine in small quantities (less than 300 mg or the equivalent of about one 12-oz cup per day) have little to no effect on the birth weight or general health of newborn babies. It is generally safe to consume one cup of coffee a day (less than 300 mg). If you stop reading this article right here- that is the safe answer to give mothers who wonder if they can drink coffee or tea during their pregnancy. But here’s the more thoughtful question: what are the effects of caffeine on me and my baby that I should be aware of throughout my pregnancy and breastfeeding? Caffeine is a stimulant that increases alertness. It slightly increases blood pressure and heart rate and the amount of urine the body makes (it is a diuretic). When you are pregnant, your body takes longer to clear caffeine from your body than when you are not pregnant. During pregnancy, caffeine crosses the placenta and reaches the baby—that means an increase in fetal blood pressure, heart rate, and urine production. Caffeine may decrease blood flow to the placenta which can harm the baby. Can caffeine contribute to fertility problems or miscarriages? Moderate amounts of caffeine (less than 300 mg per day) probably won’t reduce your chances of getting pregnant. However, some studies have found an association between high levels of caffeine (more than 500 mg per day) and decreases in fertility. In addition, studies have shown that mothers who consume more than 200-350 mg of caffeine per day are twice as likely to miscarry during their pregnancy as those mothers who consume less than that. In addition, a 2003 Danish study suggested that mothers who drink 4-7 cups of coffee a day are at a slightly increased risk of having a stillborn baby, and mothers who drank 8 or more cups a day had more than twice the risk of stillbirth as mothers who drank no coffee. How does caffeine affect the newborn? Some studies have shown a slight decrease in birth weight in babies whose mothers consumed small amounts of caffeine each day (100-250 mg). However, newborns of mothers who consumed more than 500 mg/day were shown to be more likely to have faster breathing and heart rates and to sleep less in the first few days of life. Likewise for breastfeeding, babies whose mothers consume more than 2-3 cups of coffee a day may become irritable or have trouble sleeping. Now I know you are all asking the same question: What about chocolate? Does chocolate contain caffeine, and if so, how much? Yes, chocolate does contain caffeine, but in much smaller amounts. You would have to sit down and eat an entire pound of dark chocolate to get about the same amount of caffeine that you get in one cup of coffee. So, consider ordering a Latte, Cappuccino, or Hot Chocolate next time you are at Starbucks, or better yet, get a fruit smoothie!